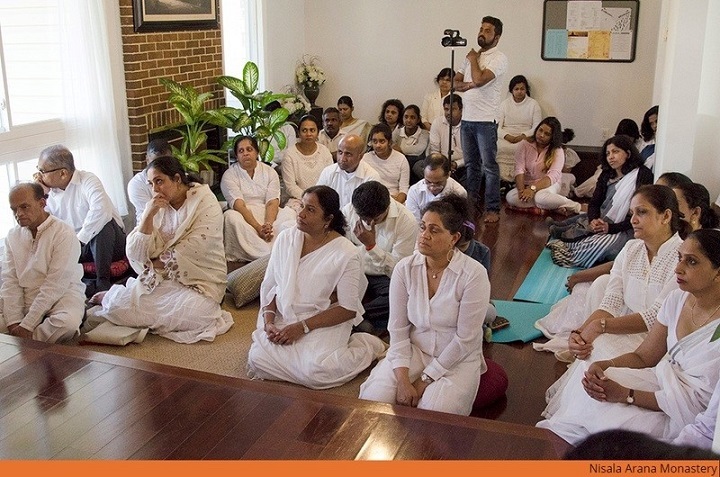 The week – long Thripitakabhivandana Week in the US reached its climax on 24th March with the completion of the religious ceremony at the Mahamewnawa Meditation Centre that saw a large gathering of devotees in attendance. The program commenced with customary religious offerings and the observance of the five precepts in homage to the Buddha followed by a dhamma discourse by the Chief Priest, Ratnapura Vajira Thero on the historical context of preserving Buddha’s Teachings and the culmination of Thripitaka”. The Chief monk narrated in sequence, the arduous journey and grueling tasks ancient Sri Lankan monks have endured under trying conditions, to record Buddha’s Dhamma sermons in the written form of Thripitaka for posterity for well over 2500 years to date. The Venerable monk also paid tribute to President Maithripala Sirisena for his historic task to make the Thripitaka a national heritage and world heritage, which he said is unparallel in the history of Sri Lanka. The monk reminded those in attendance of the great service rendered by late Sir Henry Steel Olcott, the world renowned American who had embraced Buddhism in Sri Lanka and championed the cause of Buddhists and the revival of Buddhism, and led a team that designed the Buddhist Flag and opened several Buddhist schools such as Ananda, Nalanda, Mahinda, Dharmaraja and Musaeus among others. The monk thanked all those who took part in organizing this timely ceremony and offered them the blessings of the Noble Triple Gem. Chargé d’Affaires , Sarath Dissanayke briefed the gathering on the tasks that lie ahead to make the Thripitaka a world heritage. He observed being Sri Lankans, we should take pride in this noble cause as part and parcel of our obligations toward our motherland and for the sake of making Sri Lanka the seat of Theravada Buddhism”. The Chargé appreciated the commitment and support extended by the Venerable monks, well wishers and embassy staff to make the Thripitakabhivandana Week a resounding success. The ceremony came to a close with refreshments served to those present.